The Michigan basketball team is off to the best start of the John Beilein era. On the road, though, the Wolverines are winless. As of Tuesday, 19 percent of all Division I college basketball teams sat without a road win. And the 13th-ranked Wolverines reside inside that category. Michigan will attempt to leave the aforementioned group Saturday, when the Wolverines travel to Iowa (1 p.m., Big Ten Network) in search of their first road victory since last February. With a victory, Michigan (14-3, 4-1 Big Ten) would have its best start since opening the 2005-06 year 16-3. 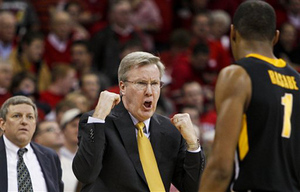 Don't tick off Iowa coach Fran McCaffery. If you watched the second half of Iowa's 34-point loss at Michigan State earlier this week, you're probably still cringing. Not from the Hawkeyes' play on the court, but from coach Fran McCaffery's paint-peeling tirade as he implored his team to do better. McCaffery already has a reputation as a fiery coach, and he proved as much in East Lansing on Tuesday. He screamed, yelled, had lively hand motions and he spiked a chair off the court. The point here is simple: If Iowa isn't ready to shoot itself out of a cannon from the get-go Saturday, then it likely never will be. The Hawkeyes have shown they can compete with teams in the Big Ten, winning back-to-back road games at Wisconsin (stunning) and Minnesota. However, in its last two games, Iowa has been beaten by an average of 31.5 points. Michigan should expect everything — kitchen sink included — from a somewhat desperate Hawkeye team during the game's first 10 minutes. Melsahn Basabe scored 25 and 19 points in two games last season against Michigan. No, that's not the number of chairs McCaffery broke at Breslin Center on Tuesday, it's the number of shots missed by Iowa forward Melsahn Basabe in two games last year against Michigan. The athletic 6-foot-7 forward went 9-of-11 for 25 points in Ann Arbor, and 8-of-10 for 19 points in Iowa City. He was Iowa's best player in both instances, and had was able to do pretty much whatever he wanted, even if the Hawkeyes lost both games. This season, however, he's been plagued by inconsistencies. He got into foul trouble against Minnesota and offered little help after that, playing 11 minutes. In a blowout loss against Ohio State, he took three shots and played 14 minutes. Against Michigan State, no one played well. Basabe wasn't excluded from the mess. Of the 37 shots the Spartans made against Iowa, 24 came on dunks or layups. So much for guarding the rim. Basabe did whatever he wanted against Michigan last season, but has been relatively up and down this year. So, that said, the Wolverines need to challenge him often. Fluster him, make him work, maybe even get him into early foul trouble. Whether it's driving attempts by Trey Burke or Tim Hardaway Jr., or strong takes by Jordan Morgan — Michigan should go at Iowa's impact big man as many times as it can. Michigan forward Evan Smotrycz has struggled in his last four games. Three weeks ago, Evan Smotrycz had everyone convinced he was a different player this season. He'd posted three straight double-doubles, and he couldn't miss a 3-pointer. Since then, however, fans have been given a glimpse into the ghost of Smotrycz's past. The 6-foot-9 forward was 1-for-7 from the floor against Northwestern on Wednesday, missing all three of his 3-pointers and struggling to finish near the basket. Against Wisconsin, Smotrycz was 1-for-6 from the floor with four rebounds. At Indiana? eight points, two rebounds and four fouls in 25 minutes. Something's been off with Smotrycz in Michigan's past four games. When he's on, though, the Wolverines are a different team — in some ways, an almost un-guardable team. Teams often need a spark on the road, and Saturday in Iowa City, a boost from Smotrycz would go a long way for the Wolverines. Hardaway was sparkling in two games against Iowa last season. In Ann Arbor, Hardaway went 5-for-10 from the 3-point line for a team-high 19 points. In Iowa City, he was better, going 5-for-7 from deep on his way to a career-high 30 points. The Wolverines needed all of his points on the road, too, as Michigan earned a 75-72 overtime victory. On the road, stars have to play like stars. And on Saturday, Hardaway has to play up to his billing. Fri, Jan 13, 2012 : 4:52 p.m.
&quot;As of Tuesday, 19 percent of all Division I college basketball teams sat without a road win. And the 13th-ranked Wolverines reside inside that category.&quot; Being technical here...but how many teams have only had two &quot;true&quot; road games (Virginia and IU), as Michigan has? If you're going to count the loss to Duke, than you need to count the road wins for Memphis and Oakland. Oops...this belongs in the Sports Section.